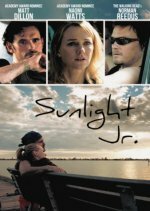 Sunlight Jr. release date was Friday, November 15, 2013. This was a Limited in theaters release. Set in the underbelly of usually sunny Florida, Melissa Winters (two-time Academy Award nominee Naomi Watts) works as a cashier at the local convenience store, SUNLIGHT JR. She lives in a seedy motel with her boyfriend Richie (Academy Award nominee Matt Dillon), a former TV repairman who lives month-to-month on his government disability check, spending most of it at a neighborhood tavern. When an unexpected pregnancy takes their lives in a new direction, they are forced to examine the realities of both of their lives, and to face tough choices about what lies on the horizon.